We offer more than 200 koozie & coolie color combinations. Always include your own logo or artwork for no extra charge. Our high quality Camo Coolies are available in Various Trademark Camo Patterns. Select from Scuba Foam or Neoprene. A picture is worth a thousand words. Does that mean if you put a photo on the front, back and bottom it's worth 3,000 words? We can do it! Imprinted Bottle Koozies available in many colors. You have the option to select a coolie with or without a bottom, with or without a zipper. Keeping your glass or bottle of wine chilled is something Personalized Drinkware is proud to help you with. 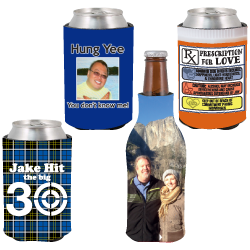 Imprinted Bottle Koozies available in many colors. What do you buy for an event that can be given to your guests as favors, can be used time and time again, and will recall a lasting memory each time it’s seen or used? Personalized coolie cups are the perfect keepsake for your friends to remember your special day, event, business, party, etc. Wow your guests, friends, and/or co-workers with a fun coolie cup completely customizable with your theme or logo. Personalizeddrinkware.com has a plethora of affordable coolie cup choices for you to buy from. We have can and bottle coolies, collapsible and non-collapsible, boot shaped, jersey shaped, small can sized, monster can sized, pint sized, growler covers, & wine bottle holders, the choices are immense. Buying options vary between items, but most items have an order minimum of 25 pieces. Included in the pricing is the printing of your design in 1 color (multiple color printing options available for additional charge), setup, and free shipping. There are many vibrant coolie color choices as well as ink color choices. Our art department is available to help with your design if you don’t have one available or you have a vision, but are no artist. We also have a large clipart gallery with many great design ideas you can choose from, all can be customized just for you. You can even request a free proof before buying by clicking the “Free Proofs” button at the top of the page on our website. Fill out the form and a free proof will be emailed to you within 24 hours. We have customer service representatives ready to help through Live Chat on our website or when calling us at 866-989-8880. We are here to make your buying process as smooth as possible and your experience stress free. Make your next event a hit and buy some personalized coolie cups today!